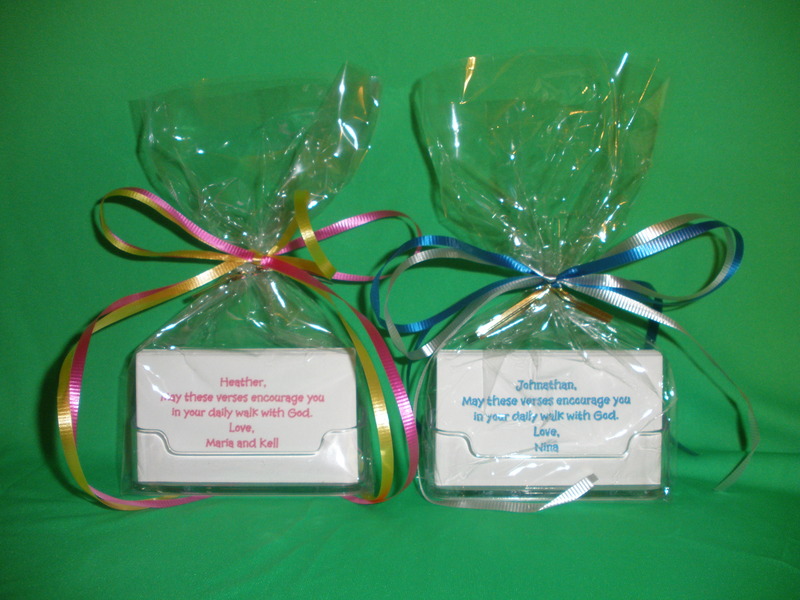 We offer an unique gift of encouragement to those who need their spirits lifted. Who can encourage more than our loving God as He speaks to you personally in every card you read. 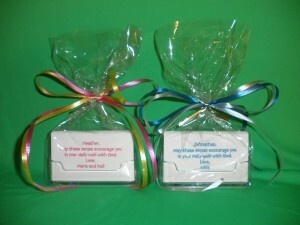 These cards are an ideal gift or encouragement for all occassions. Since March 2009 people have been giving these cards for Birthdays, Valentine gifts, Graduation presents, and Christmas gifts. Others love to use our 121 Cards as a gift of encouragement for those loved ones with difficult medical issues, hospital patients, cancer survivors, and those who have lost loved ones. Our 121Cards are for anyone you wish to encourage or inspire. Please email us at 121cards@comcast.net and let us know how we can serve you. 121 Cards was born out of simple beginnings. My wife, Cheryl, was given a set of personalized devotional cards as a Christmas gift in 2007. Daily she would be encouraged as she read the cards and God would speak to her through His own words as written in the Bible and on her cards. In 2008, Cheryl picked her own verses, 59 of them, to give as Christmas gifts to her close friends and our son’s teachers. Cheryl gave her hair stylist, Cammy M. a set in which she placed in her work area. Within days, a friend of Cammy’s, Leslie M. from Colorado Springs, Co. (we live in Brentwood, TN) called to have some cards made for her friends. Before we knew it, Leslie had ordered 11 sets of personalized devotional cards. Additional requests came from other people who had seen the cards. In March 1, 2009 we obtained a grant/license from Zondervan for permission to use the NIV selections and sell our 121Cards in the United States. Since that time our cards have found their way to Iraq, Germany, Russia, Scotland and Mexico. The neatest thing about our business is that it has provided us an opportunity to encourage others by making these cards. Because God has blessed us with more than we deserve, we are able to encourage others by giving most of our profits to help some local mission efforts that we support in the surrounding Brentwood/Nashville area. Thank you Cheryl, and I can’t wait to give these as gifts. Thank you again! I LOVE these devotional cards!!!!! Leslie M.
Lisa S. told me about the Christmas gift you got for Cammy—the personalized scripture cards—and I would love to know where you got those! Several people on my gift list I would love to give that kind of gift to…. Wow! That is great service! Laurie W.
Cheryl, Thank you so much for the cards! I don’t need to tell you how great I think they are! Whenever you are up and running, I would like one for Nancy P. and Betty (my mom). Torie N.
More from Leslie…The cards arrived in perfect condition!! I love how you packaged them! I gave my sister-in-law hers and she flipped over them ( I knew she would) and she couldn’t wait to give the cards to her friend, Barb. I would like to order 5 more sets of devo cards. Thank you so much! Have I told you how much I love these cards? Well, I DO!!!!! Leslie M.
Thank you for the information so quickly! I think God’s Word is an excellent gift, too, and an encouragement in tough times! For right now, I’d like to order a set of cards for “Annette”. Marla S.
David & Cheryl, You are awesome with everything you do for others. You may not feel like what you are doing is very big, but it is making a huge difference in people’s lives! You do so much for others. Lisa S.
Kathy C. gave me a set and I absolutely love them. They are on my desk at work right under my computer screen. Heather B.